Rawan Yaghi: The five veiled women were gesturing, confidently, at other women to get closer. They wanted more voices to join in. My friend and I had already made it past the designated protest line and were next to the journalists and the ambulances standing by. We got closer still. Rhythmically, the women chanted “Going Back,” a cult song by the Palestinian activist poet Abu Arab, drawing demonstrators into their small concert. They ululated and then sang some more. A couple of children were jumping up and down, screaming out the few lyrics they knew: “I will return to my country. To the green land, I will return.” The crowd, a few hundred strong, armed with nothing but cellphones, clapped along. 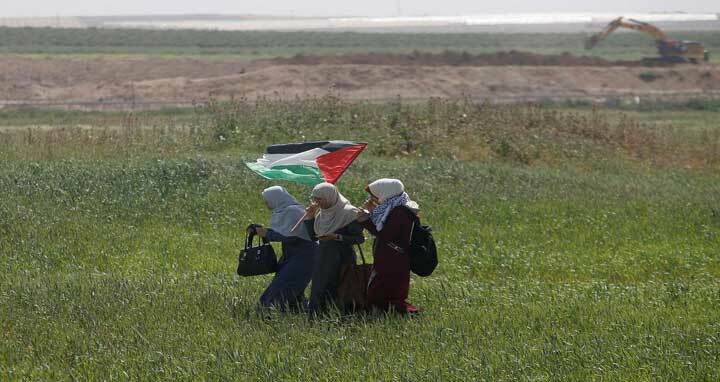 People stood on a farmer’s land, on the edge of Al-Zaytun, an eastern area of Gaza City, looking out onto the green fields beyond the Israeli snipers’ helmets and sand barriers. A group of clowns with white face paint and red noses squeaked noisily in the rising and falling tones of Gaza’s Arabic dialect and hopped around. One of them grabbed a mic in front of a TV camera and started imitating news correspondents, quacking unintelligibly but as determined as if he were saying real words. This was Sunday. On Friday, the first day of what was supposed to be an extended peaceful sit-in, Israeli soldiers had shot into another crowd of some 30,000 Palestinians who had gathered by the border to commemorate the killing in 1976 of six Palestinian citizens of Israel during another protest still, over Israel’s expropriation of Arab land. At least 15 demonstrators were killed last week. On Sunday, people lined up some 200 meters away from the fence separating them from the Israeli soldiers. Palestinian men in civilian clothes wouldn’t allow them any closer. Only one man in a mobility scooter couldn’t be stopped from entering the hot zone between the crowd and the fence. When he entered the area, several rounds of bullets sounded out, but he wasn’t hit. “They don’t want to kill another disabled activist,” one of the journalists said. He was referring to Ibrahim Abu Thuraya, who had lost his legs (reportedly in a 2008 Israeli airstrike) and was shot in the head during a demonstration in the West Bank in December. “Otherwise, he would have been killed a while ago,” the journalist added, about the man in the special scooter. More bursts came, sudden and loud. The protesters got down. When they realized it was tear gas that had been fired, they straightened up. Lines of white smoke streaked up the blue sky and then dropped to the ground; a low cloud draped the figure of the disabled man on his machine. Moments later, paramedics rushed to help him. Eleven people were injured on Sunday in various protests throughout the Gaza Strip, according to Gaza’s health ministry. One of the women who had been howling, her eyes lined in kohl and blurry with tears, said: “This march is uniting us, if nothing else. Men and women of all backgrounds.” A sense of togetherness did seem to have developed among the small number of people gathered in front of the lurking Israeli snipers. “It’s not a march to return to our land at this very moment. It’s a way for us to speak and to raise our voices,” the woman said. Behind the protesters three boys aged 10 to 13 were playing football, kicking the ball high in the sky, well within range of the snipers’ viewfinders. The protesters who gathered under the burning midday sun displayed a kind of resigned hope. As if to say: We have nothing to lose, so we come here to scream our lungs out. Some knew well that they risked more than burned skin and a sore throat; they had been injured on Friday. One man came on crutches and hopped about on one foot, the other foot swinging from a scaffolding of metal sticks and screws. I left the protest thinking of the rest of Gaza — shellshocked for years, its borders closed and its United Nations-funded infrastructure in decay. I thought of the kids in my neighborhood who play football in what used to be the ground floor of a tall residential building, with bare concrete columns and poking iron rods as their only audience. And I thought: Once again, Gaza the Injured has come out to protest, and to scream for life.